In face of a recession that never recedes, the assumption of a broad and growing prosperity for the middle class is in doubt. Gone are the heady days of the post-Cold War triumphalism of the nineties when optimistic observers believed that we might live forever in a kind of glorious consumerism. Instead, there is a universal perception that the middle class has been “hollowed out” and the gap between rich and poor widened. Everyone denounces the growing ranks of underemployed, unemployed and those who have simply left the work force altogether. All sense something vitally wrong. Of course, those on the left clamor for middle-class job creation, more infrastructure projects, and job training, all paid for by government borrowing at today’s extremely low interest rates. Jumpstart the economy with shovel-ready projects, entitlement programs and good jobs, they claim, and all will return to normal. In a similar and more realistic vein, the right asks the government to free the market from its cumbersome regulations and taxes and it will generate jobs aplenty. While both sides clamor for jobs, they fail to call for work. The old distinction between “job” and “work” could well shed some light on where we need to go to solve our economic problems. The word “job” is recent, dating from the Industrial Revolution. Its original meaning was “a pile of things to be done,” and now insinuates something done indifferently for hire. On the other hand, the word “work” is a very old word dating back to medieval England. Its first appearance is in the eleventh century Aelfric Homilies which stated that “work was begun under God’s will.” Work refers to an activity done for its own sake, motivated by a pleasure or passion for that which is done, as in a work of love or a work of art. That is to say that a job implies limited commitment on the part of employer and employee alike. It is an individualistic commercial contract based upon the rule of money as the standard upon which all is judged. Since the job is a mere unit of labor, the employer is free to shuffle these units around at will, even offshore. On their part, employees often assume an indifferent attitude towards their jobs—as willing pairs of hands—since their employment represents nothing more than the financial means to secure the pursuit of happiness and self-gratification. What is missing is the human element that has been hollowed out of the economy. Our economy has taken on a mechanical character where people really don’t matter anymore since they are but numbers in bureaucratic databases or statistics in political campaigns. Of course, there are times when people need “jobs” as temporary avenues to secure sufficient income to live. But the job should not be the norm. It cannot become a panacea for all our economic ills. Indeed, creating jobs for jobs’ sake tells people they are expendable. Work is something different; it confers dignity and value. Because work involves a passion for something, it goes deep into the soul. Work is not all about money. It involves relationships, honor and loyalty that bind together employer and employee, producer and consumer, and even families and generations. Work looks for craftsmanship, profession and calling. It includes God since real work takes on a prayer-like character. Happy are those whose jobs correspond to their work—and there are still many on all levels of society. They are dynamos for any economy since their work is full of that vital flux that infuses passion, excellence and meaning into commerce and society. Everything should be done to encourage “work” through sound family, tax and other policies. However, the main action cannot be governmental. A “work” vision of society relies heavily upon rebuilding a moral infrastructure based on strong ties to family, faith and community. Moreover, it invokes God who, in His Providence, can “provide” for man much more efficiently than governmental bureaucrats. The problem is so many are unwilling to even consider moral issues in the context of economic problems. They refuse outright to make the link between human relationships and business transactions. They prefer to reduce everything back to jobs. 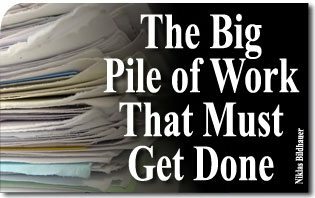 Our efforts to rescue the present economy will be to no avail unless we look beyond the “piles of things to be done” and help those who will work to follow the desires of their hearts.